The 9-4 favourite Don Cossack and jockey Bryan Cooper held off the challenge of Djakadam to win the Cheltenham Gold Cup. Later, Olympic cycling champion Victoria Pendleton finished fifth in the Foxhunter Chase on Pacha Du Polder. Pendleton gave her mount a patient ride at the rear of the field, before moving through nicely and staying on strongly, but Nina Carberry was too good in front, winning on the 13-8 favourite On The Fringe by a neck for back-to-back wins in the race. 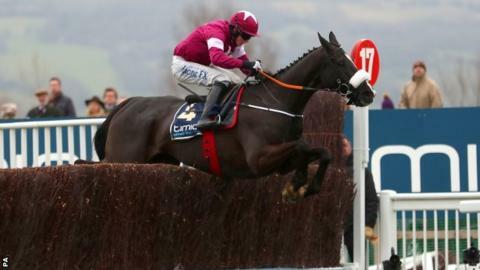 It made it another success for the Irish on a day when Don Cossack showed his strength in the feature race, winning by four and a half lengths. It was a first Gold Cup for Elliott, who won the Grand National in 2007 with Silver Birch, and for Cooper. The 23-year-old jockey from Kerry had a dilemma over which horse to ride with both Don Cossack and Don Poli owned by airline boss Michael O'Leary's Gigginstown House Stud, for whom Cooper is the retained rider. His decision to opt for the nine-year-old, who recovered from a fall in the King George at Kempton on Boxing Day to win at Thurles in January, paid dividends and afterwards he paid tribute to the late trainer Dessie Hughes with whom he started his career. "Fair play to Gordon, he stuck by me. I had the hardest decision and he had him right for today. He never missed a beat," said Cooper. "It was a hard decision to make, but there's a man up there looking out for me, Dessie Hughes." The 9-2 favourite Ivanovich Gorbatov gave Aidan O'Brien his first Festival winner since Istabraq's third Champion Hurdle win in 2000 when he stormed home in the JCB Triumph Hurdle. With O'Brien concentrating on the Flat, it is his son Joseph - recently retired from riding - who supervised the hurdler's preparation as he prepares to get his full training licence. The win for the JP McManus-owned 9-2 favourite gave jockey Barry Geraghty his first success of the week, with Willie Mullins training the second and third in Apple's Jade and Footpad. O'Brien Jr, who won two Epsom Derbies as well as the 2000 Guineas and St Leger in his riding career, said: "It's unbelievable. I don't think it's sunk in yet. It's very hard to put into words what I'm thinking right now. "It's hard to compare [to winning the Derby] but it's right up there." Elsewhere, two former assistants to Paul Nicholls, Dan Skelton and Harry Fry, both enjoyed success while Nicholls himself claimed a final-day double. It was a family affair for Skelton as younger brother Harry rode Superb Story (8-1) to victory in the Vincent O'Brien County Handicap Hurdle to give them their first Festival success, watched by their father Nick, who won equestrian gold at London 2012. "I'm so delighted for them, they work really hard," said their proud dad. "Harry's been saying for two weeks this horse would win. Everything worked out. I thought he'd committed too early, but he knew what he had underneath." Fry won his third Festival race when Unowhatimeanharry (11-1) took the Albert Bartlett Novices' Hurdle under Noel Fehily, overhauling long-time leader Barters Hill after jumping the last. Nicholls, who had a relatively quiet Festival by his standards, finished on a high, winning the last two races on the card. The success by three and three-quarter lengths was a third win of the week for Sam Twiston-Davies and ensured the battle between Irish and British trainers over the course of the meeting ended level with 14 wins apiece. The British Horseracing Authority is to fully assess the number of deaths at the Cheltenham Festival after seven horses died over the four days of racing. Three horses, The Govaness, Rezorbi and Pont Alexandre died on the opening day of the festival, whilst No More Heroes had been put down after damaging a tendon in the RSA Chase on Wednesday. There was one further death on Thursday as Niceonefrankie suffered a fall in the Stable Plate Race and on Friday Montdragon and Long Dog died. Jenny Hall, chief veterinary officer of the BHA, said: "It is notable that four of the fatal injuries incurred this week were not related to a fall over a hurdle or fence. "It is not possible to eradicate risk completely from any activity in which horses are involved. "We will work with Cheltenham to assess all of the incidents that took place this week. We have a good relationship with the RSPCA and World Horse Welfare, and, as always, we will work with them to ensure we continue we do all we can to make racing as safe as possible."